As a colour, grey gets pretty bad press; associated with bad weather and gloomy days. 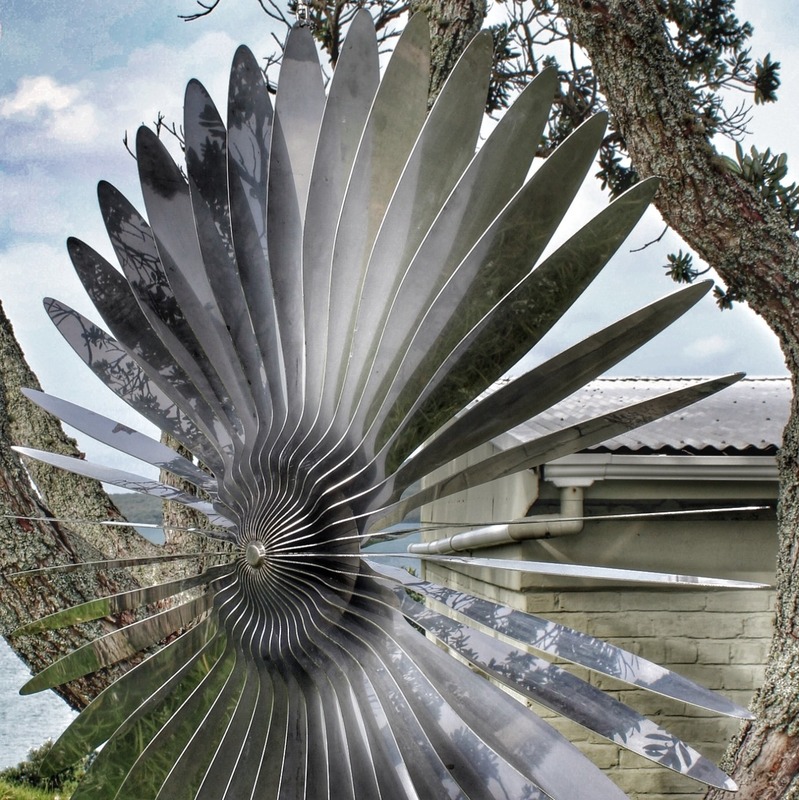 But it is also the colour of many sculptures — like the bronze above which commemorates the enormous contribution made by women during war — and Rebecca Rose’s “Inflight Entertainment” below, which is made of stainless steel. The works below, by Trish Clarke and Merle Bishop are also in steel and bronze respectively, although the grey that predominates in the image is that of a stormy evening sky. 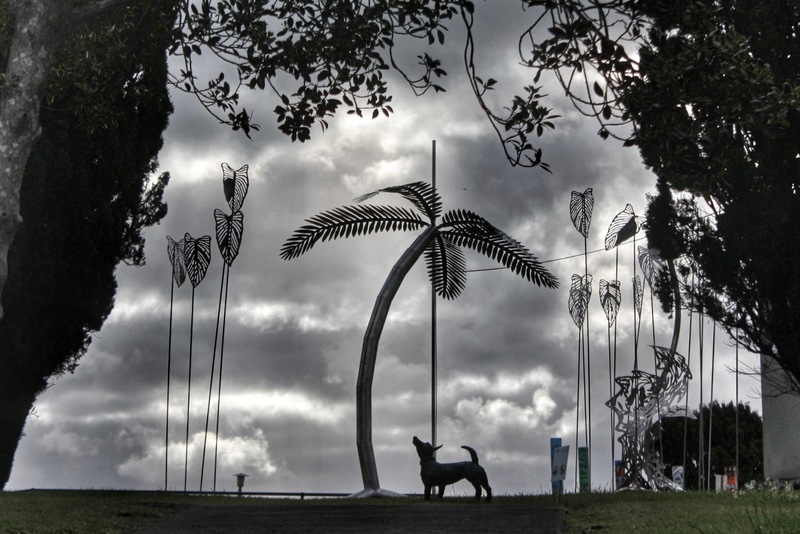 Trish Clarke’s “Round Up aka Triffid Garden”, and Merle Bishop’s “Spot the Blind Dog”, exhibited at NZ Sculpture OnShore, 2014. Photo: Su Leslie, 2014. 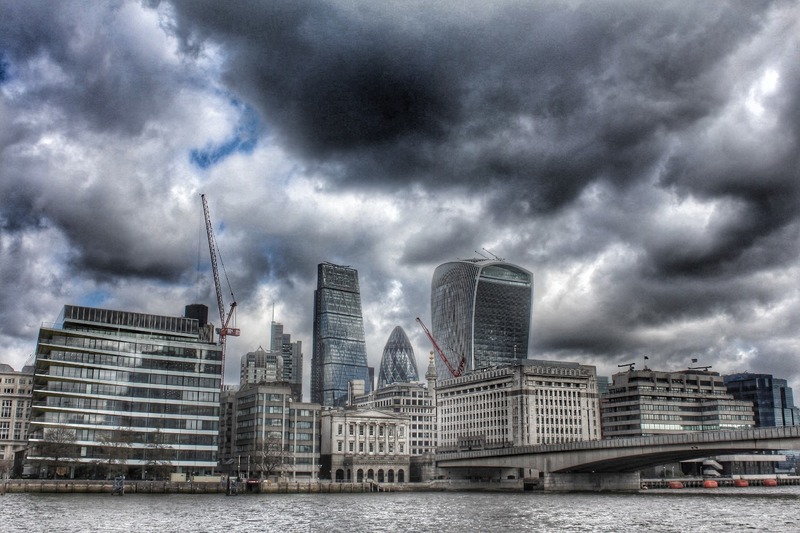 In the two shots above, leaden skies hang over already grey structures. In countries were rain is abundant (like the UK and New Zealand) grey clouds are often spoken of negatively — something I’ve noticed increasingly in our TV weather forecasts. For me, they speak of drama and change — things I view positively. The statue of the women of World War II is very dramatic. I love the detail in the clothes. I think i could sit and look at that piece all day. Thank you for sharing. Thanks Sue; it is a powerful piece. Hi Su, my favourite is the second to last – the juxtaposition of Spot The Blind dog and Round up – aka Triffid garden, and the frame of the shot, all work for me. Thanks so much Jill. I loved those pieces and they worked really well together. 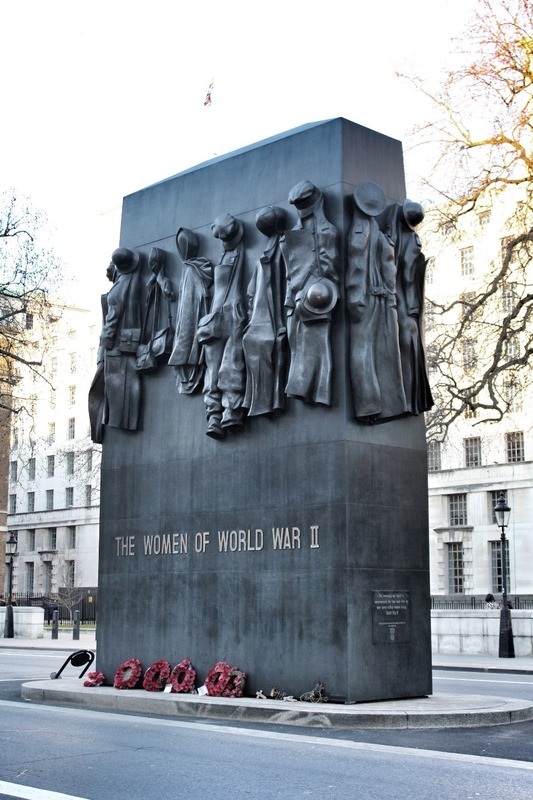 I didn’t know that memorial to the women of WW2 existed – it’s wonderful. Neither did I. Dedicated in 2005 apparently. About time! That last image of London is a stunning image of a culturally and historically rich city that works so well in monochrome. I just love your images. They are all powerful. I especially love the first one – finally women are being recognised for their war work. Thanks Raewyn. I’d walked up Whitehall lots of times when I lived in the UK and so was really pleasantly surprised to see the monument near the cenotaph. As you say, it’s about time! You have given grey some really good press. Wonderful photos. Wonderful photos, Su. I love that sculpture dedicated to the women of WW11. It’s really effective how they have shown just the clothing – symbolic of having shouldered those responsibilities during the war, but then put them aside when the men came home. Only woman didn’t ever shut the lid on that box again! Reblogging. Some lovely sculptures here on Su Leslie’s blog … go have a look. I love the sculpture dedicated to the women of WW11. It’s really effective how they have shown just the clothing hanging – symbolic of having shouldered those responsibilities during the war, but then put them aside when the men came home. I’m going to echo the comments made about the tribute to women. Sometimes the artist really gets it right in their design and this is one of those!! … but the Triffid Garden also looks amazing.